I bought these boots last week, and they should arrive on Monday. I've been wanting Frye boots for years now. I'll be so tough looking and my feet will be super comfortable. Also, I will not be wearing sneakers--it will be nuts. Technically, I already have Frye boots. 2 pairs. One is sitting in my closet because, though I managed to jam my feet into them in the store 3 years ago, I haven't been able to replicate the feat since (pun intended). And since I bought them on super sale using a gift card from a store 2,000 miles away, I'm kind of stuck with them. Pair number 2 is sitting in the trunk of my car waiting to be returned (the mailing of a package is involved--not my specialty). They're these amazing cowgirl boots that would have made me stand out a little less in the hipsterville that is my neighborhood. Except I wouldn't wear them with purple tights and a romper stolen from a 5-year-old. 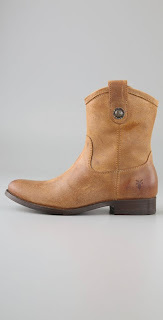 Anyway, why do I have so much trouble with Frye boots? Or boots in general? Excellent questions. It's because I have freakishly large heels, apparently. My feet are not built to slip into boots. Boots cannot even be stretched to accomodate my oddly-shaped feet because, according to the cobbler I spoke to, no one but me has ever had this problem before ever. But these boots, these glorious boots, have zippers down one side. Hopefully by run of bad boot-related experiences will soon come to an end. Fingers crossed, people. Just so you know, these boots were on mega sale when I bought them. Please keep the judging to a minimum. Also, please don't remind my husband that the boots in the trunk of our car are actually the second pair of Frye boots in my possession. I have decided to start blogging again. There is just too much stuff that I want but cannot buy. Watch out world, you're about to get one more ladyblog paying homage to conspicuous consumption.